You can broaden the appeal of your SharePoint Framework client-side web part by localizing it for different languages spoken by SharePoint users all over the world. In this article, you will localize a web part to the Dutch (Netherlands) locale, and verify that the localized values are displayed correctly. Create a new folder for your project. react-localization as your solution name. SharePoint Online only (latest) as the baseline package set. Use the current folder for the location to place the files. y to allow tenant-wide deployment. WebPart as the type of component to develop. Greeting as your web part name. Greets the user as your web part description. React as the starting point to build the web part. Open your project folder in your code editor. 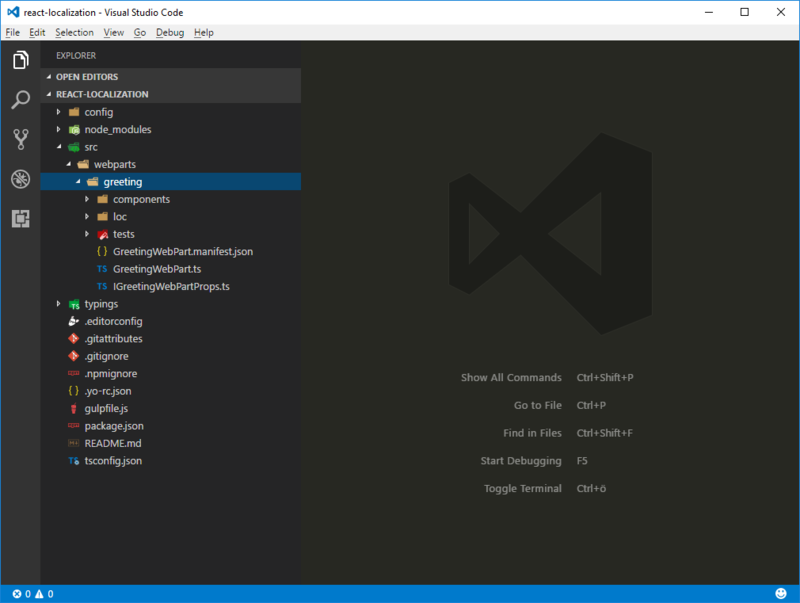 This article uses Visual Studio Code in the steps and screenshots, but you can use any editor that you prefer. 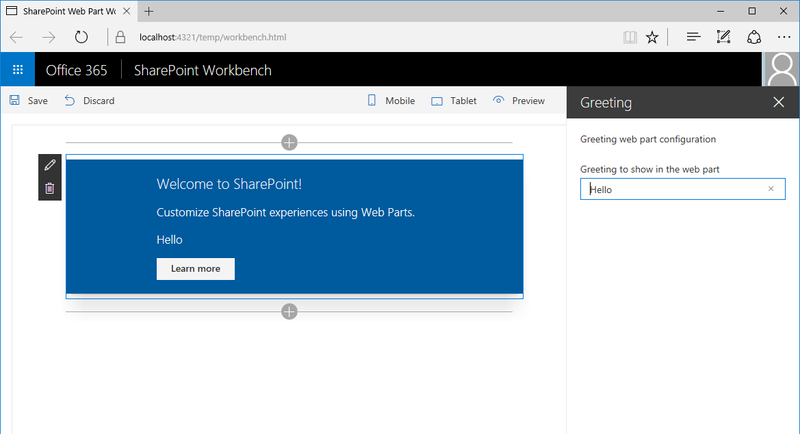 "GreetingFieldLabel": "Greeting to show in the web part"
In the SharePoint Workbench, add the web part to the page, and open its configuration. 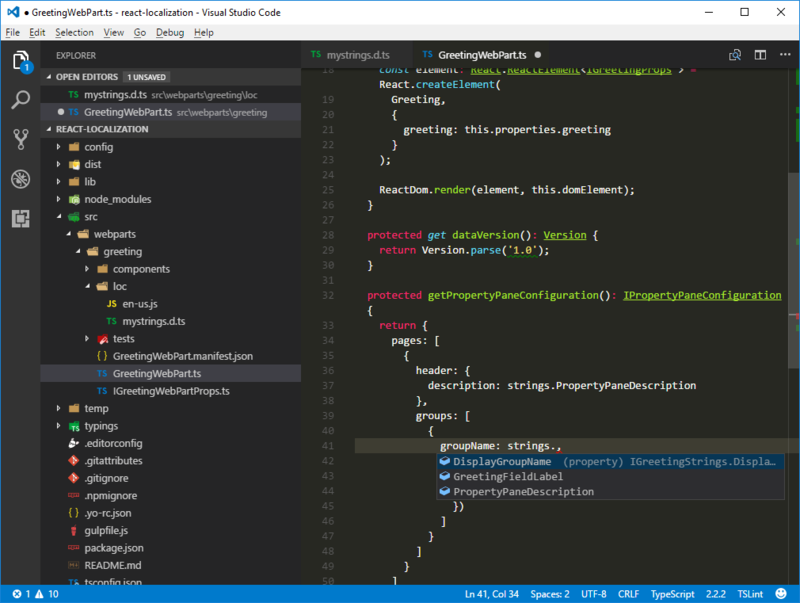 Every SharePoint Framework client-side web part consists of code and a manifest. The manifest provides information about the web part such as its title, description, and icon. When adding a web part to the page, the information from the web part manifest is displayed to users. Using this information, users decide if the web part is the one that they are looking for. Providing a title and description that correctly reflect the web part's functionality is essential if you want your web part to be used. If your web part is used on non-English sites, localizing its metadata can improve the user experience even further. Some properties defined in the web part manifest, such as title or description, support specifying localized values. For the complete list of all web part manifest properties that support localization, see Simplify adding web parts with preconfigured entries. Properties that support localization are of type ILocalizedString. Each localized string must specify at least the default value and optionally values for other locales. 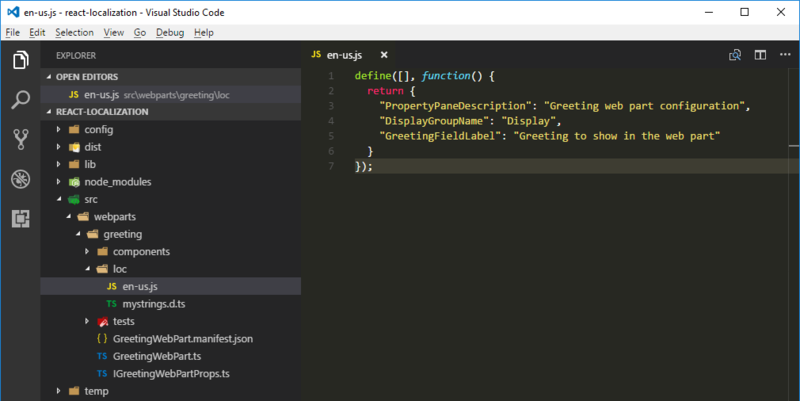 In the code editor, open the ./src/webparts/greeting/GreetingWebPart.manifest.json file. Unfortunately, the SharePoint Workbench doesn't currently support previewing the localized values from the web part manifest. It always uses the default translation. When working with a web part, a user often needs to configure it for their specific needs. Providing descriptive labels for the different configuration settings improves the usability of the web part and decreases the number of support requests from users for help configuring web parts. The web part property pane consists of sections. Each section has a header and one or more controls that allow users to configure the web part. Each of these controls contains a label that describes its purpose. The localization files used by the web part are stored in the ./src/webparts/greeting/loc folder. The loc folder contains a TypeScript type definition file (./src/webpart/greeting/loc/mystrings.d.ts) that informs TypeScript of the different strings included in the localized files. 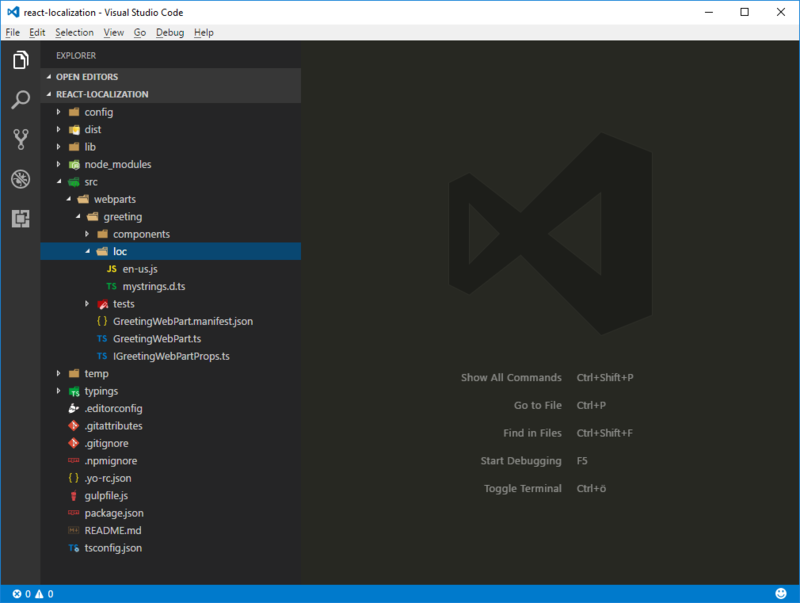 Using the information from this file, your code editor can provide you with IntelliSense when working with strings in code. Additionally, while building your project, TypeScript can verify that you're not referring to a string that hasn't been defined. The default locale used by the SharePoint Framework is en-US. If your web part is used on a site that uses a locale not supported by your web part, the SharePoint Framework uses en-US as the default locale. You can override this behavior by creating a locale file named default.js with the translations in your preferred language. While the name default.js doesn't follow the locale naming convention, it signals to the SharePoint Framework build process to use that particular locale file as the fallback locale instead of the standard US English locale. "GreetingFieldLabel": "Begroeting die in het webonderdeel getoond wordt"
Verify that the keys in the TypeScript type definition file for localization match the contents of the locale files for US English and Dutch (Netherlands). 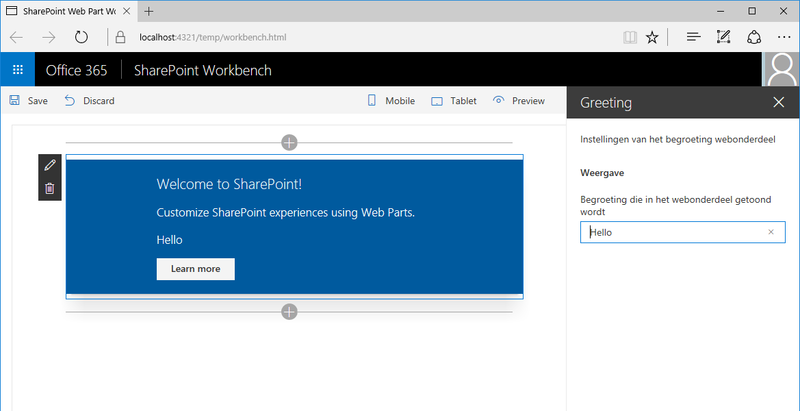 When testing web parts by using the hosted version of the SharePoint Workbench or team sites on a developer tenant, the locale of the context site expressed by the spPageContextInfo.currentUICultureName property is used as the default locale. 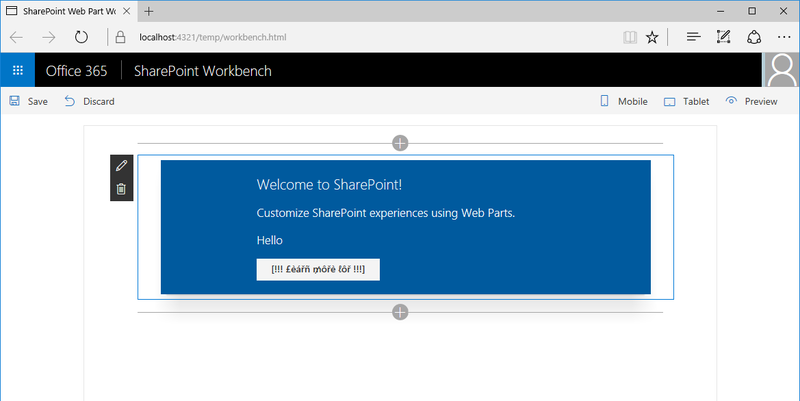 When testing web parts by using the local SharePoint Workbench, the SharePoint Framework uses by default the en-US locale to display web part property pane strings. There are two ways in which you can test the values from other locales supported by your web part. One way to specify the locale to be tested in the SharePoint Workbench is by editing the project configuration. This approach is useful if you and your team members are working with a locale for a longer period of time, or if you're building a web part that doesn't support US English. When you add the web part to the page and open its configuration, you'll see the strings in the web part property pane displayed in Dutch (Netherlands). Another way to specify the locale to be used by the local SharePoint Workbench is to specify it as an argument for the gulp task. Once again, when you open your web part's configuration, you'll see that all property pane strings are displayed in Dutch (Netherlands) rather than the default US English. The default web part provided with the scaffolded SharePoint Framework project has its strings embedded in the code. Before you can localize these strings, you have to replace them with references to the localized strings. This process is often referred to as globalization or internationalization (or i18n for short). In the code editor, open the ./src/webparts/greeting/components/Greetings.tsx file. Having replaced the string with a reference, the next step is to add that string to the localization files used by the web part. The last step is to provide localized versions for the new string in all locales supported by the web part. Using localization when building web parts offers clear benefits but is also something that developers overlook easily. Often, translations to other locales are provided later in the project and it's difficult for testers to verify that all code properly supports the different locales. The same words in different locales have different lengths. For example, the same sentence translated from English to German or Dutch can become 35% longer. Without all translations available upfront, it's difficult for developers and designers to ensure that the user interface can properly accommodate longer strings. Some languages use special characters beyond the standard ASCII character set. If designers use a non-standard font, it is possible that the font doesn't properly support some special characters. Finding out about all these issues late in the project will likely lead to delays and costly fixes. The SharePoint Framework allows developers to use pseudo-locales to address these issues while building web parts. What are pseudo-locales? Pseudo-locales are locales designed to test software for proper support of the different aspects of the localization process, such as support for special characters, right-to-left languages, or accommodating longer strings in the user interface. "LearnMoreButtonLabel": "[!!! £èářñ ₥ôřè ℓôř !!!]" You can convert US English strings to their base pseudo-locale equivalent at Pseudolocalize!. By increasing the length of the generated string by 35%, you should be able to simulate the length of strings translated to longer locales such as German or Dutch. Additionally, by surrounding the translations with brackets and exclamation marks you can more easily see if the whole string is displayed on the screen. After adding the web part to the page, you can quickly see that there are two strings in the web part body that have not been internationalized and are still displayed in US English rather than in the base pseudo-locale. Open the web part property pane, and confirm that all strings and their special characters are displayed properly and that they fit in the available space correctly. SharePoint supports Multilingual User Interface (MUI) where the site administrator can enable multiple languages for the user interface. When the user visits the site, its UI automatically is displayed using the preferred language based on that user's preferences. Web parts used on multilingual sites should automatically detect the currently used language and display their contents in that language. The SharePoint Framework simplifies this process by automatically loading the resource file corresponding to the currently used language. 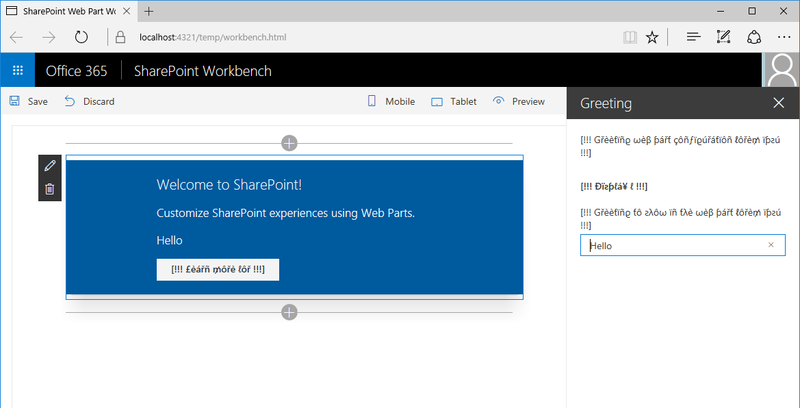 Additionally, when testing SharePoint Framework web parts using the hosted version of the SharePoint Workbench, the Workbench also automatically uses the language preferred by the user. Values configured through web part properties are not stored in resource files. By default, the configured value is used as-is, which might lead to inconsistencies, such as greeting the user in English when the user's preferred language is Dutch. By using the building blocks provided with the SharePoint Framework, you can extend your web part with support for storing web part configuration values in multiple languages. For each of the supported languages, the property pane displays a separate text field in which the user can enter the translated value for that property. 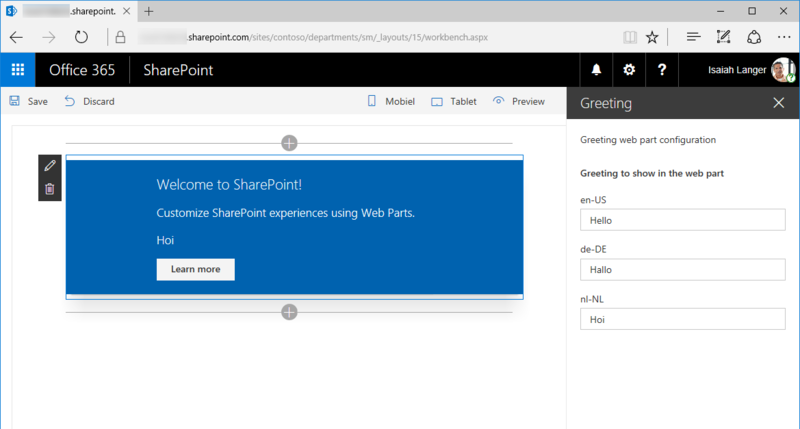 The SharePoint site used to test the web part shown in this article is a multilingual site with the US English, Dutch, and German languages enabled. For more information about enabling additional languages on SharePoint sites, see Choose the languages you want to make available for a site’s user interface. The list of languages enabled on a multilingual SharePoint site is returned as an array of locale identifiers (LCID), for example, 1033 for US English. In the code editor, open the ./src/webparts/greeting/GreetingWebPart.ts file. The locales variable lists all languages supported by SharePoint Online. Originally, the Greeting web part had the greeting property defined where the user could specify the greeting to be displayed on the screen. 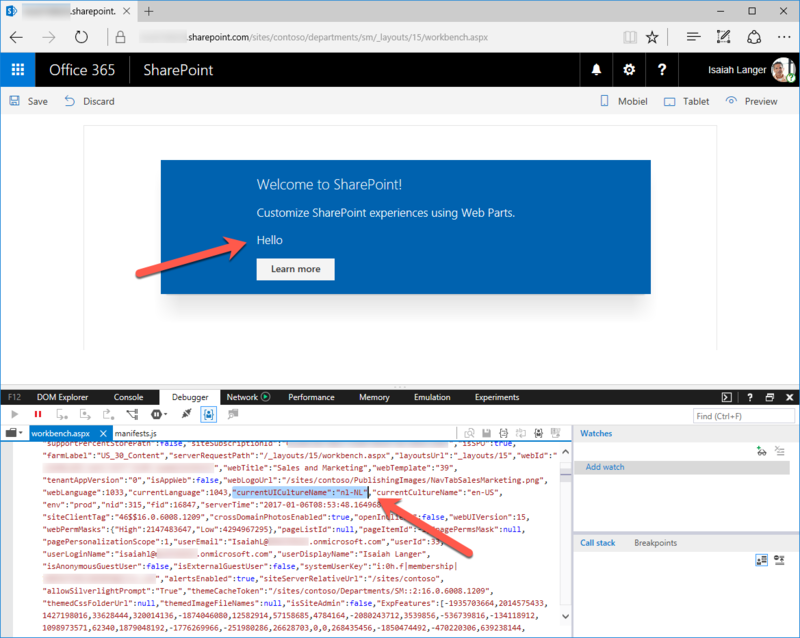 To adapt the web part to support multilingual SharePoint sites, you need to store multiple values; one for each language. Because you cannot know upfront which languages will be enabled on the site, rather than using one static web part property, you can dynamically generate web part properties at runtime. With this modification, you can pass the greeting to be displayed from the web part to the React component. Initially, by using the web part configuration, the user could configure a welcome message. The web part allowed the user to configure a single value that was displayed to all users no matter what their language preference was. By retrieving the list of languages enabled on the current site, you can dynamically display text fields to allow the user to provide translations for all the languages enabled on the site. The first step is to load the information about all languages enabled on the current site. Because we will be querying data in SharePoint, we use SharePoint Http Client for the operations. Add the following imports just above the GreetingWebPart. The list of languages enabled on the current site should be loaded only once. 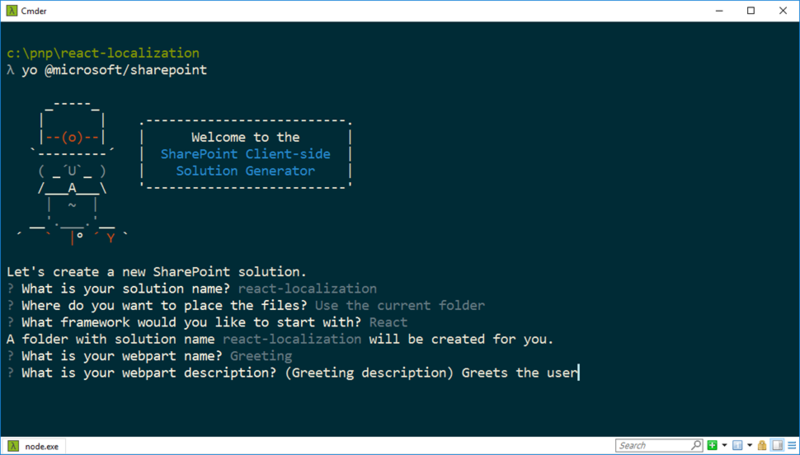 If the information about the languages hasn't been loaded yet, the method uses the standard SharePoint Framework HTTP Client to call the SharePoint REST API and retrieve the information about languages enabled on the current site. Now that you can retrieve the information about the languages enabled on the current site, you will display text fields for each of these languages so that the user can specify translated values for the greeting message. If the site has multiple languages enabled, the web part renders multiple fields for the user to enter the greeting message. To make it clear that these fields belong together, put them in a separate group. Update the resource files accordingly to provide values for the GreetingGroupName string. When the user opens the web part property pane, the method loads the information about the languages enabled on the current site. Because loading this information might take a moment, the method displays a loading indicator communicating its status to the user. After the information about the enabled languages is loaded, the method creates a new property pane text field linked to a dynamic web part property named greeting__lcid_, for example, greeting_1033 for US English. After the text fields for all enabled languages are constructed, the method refreshes the property pane by calling the IPropertyPaneAccessor.refresh method. Finally, the method clears the web part loading indicator and re-renders the web part body. Originally, the web part showed the same greeting for all users no matter what their preferred language was. Now that the web part has different translations of the welcome message stored, it should display the greeting that uses the language preferred by the current user. This method gets the currently used language and converts it to a locale ID. It then returns the value of the greeting property translated to that language. Depending on the selected build mode, the SharePoint Framework handles localization files differently. Following are some of the differences between the files generated in a debug build and a release build. When building SharePoint Framework projects in debug mode, only the information about the default locale is included in the generated web part manifest. 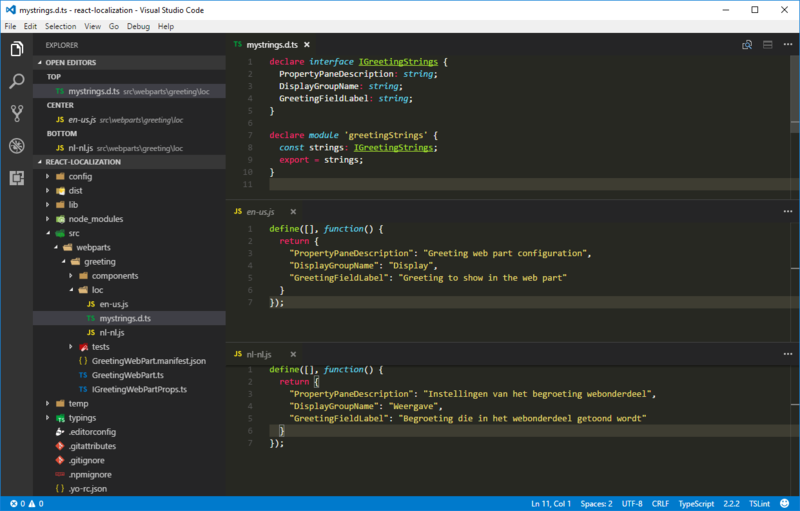 In debug mode, SharePoint Framework uses either the default en-US locale, or the locale that has been specified in the project configuration or by using the locale argument in the command line. Resource files with translated strings are not included in the output dist folder. Instead, they are loaded at runtime from the intermediate lib folder by using the path in the generated web part manifest. Looking at the information about the GreetingWebPartStrings module in the web part manifest generated during a debug build, you can see that despite the different locales supported by the web part (en-US, nl-NL, and qps-ploc), the path to the en-US resource file stored in the intermediate location has been assigned as the default path of the localization module. When building SharePoint Framework projects in release mode, the information about all available locales is included in the generated web part manifest. Additionally, resources for each locale are stored in a separate file. These resource files are copied, along with the web part manifest and the web part bundle, to the ./temp/deploy folder. In release builds, resource files are copied only to the ./temp/deploy folder and not to the ./dist folder. When deploying your web part to production, you should always use files from the ./temp/deploy folder to ensure that you are deploying all files required by your web part. Examining the latest web part manifest generated in a release build, you can see that now the GreetingWebPartStrings module contains references to all supported locales. When loading the web part on the page, the SharePoint Framework automatically loads the resource file for the corresponding locale by using the information from the context site. If no matching resource file is found, the SharePoint Framework loads the file specified in the defaultPath property. By keeping the resource files separate, the SharePoint Framework minimizes the amount of data loaded on the page to the locale that matches the one used on the site.